Gracious living spaces to make the Springs floor plans your own. With a variety of living arrangements, you’re sure to find the perfect fit for your needs. All monthly lease fees include rent, utilities (excluding phone and cable), maintenance, housekeeping, scheduled transportation, and three meals daily, including two snacks. The monthly fee also includes assistance with medication (for assisted living and memory care residents), scheduled transportation to medical appointments and a full calendar of exciting activities. We’d love to show you the Springs floor plans, in all their glory! Contact us today to schedule your visit! The Springs floor plans offer six unique styles of independent living apartments for seniors. The Garrison House, the former home of our owner’s grandmother, has been renovated into 3 charming apartments, and we have 3 additional independent apartments at the community. Each floor plan is slightly different; all floor plans include a private bath, private bedroom, sitting area, and full kitchen with modern appliances. Total square footage for independent living apartments is approximately 500+/- square feet. Apartments have private entrances. Note that each of the 6 independent living floor plans is slightly different and the sample shown is for reference only. Each floor plan in our assisted living community comes with the peace of mind of having caring staff at hand—day or night. Floor plans vary by square footage and design; however, all floor plans include a private bath with walk-in showers and grab bars for added safety. Note that floor plans may vary slightly and images shown are for reference only. The Carolina Semi-Private Suite offers the affordability of companion living. Apartments include a large, shared bedroom space, a shared bathroom, and a private closet for each resident. Total area is approximately 335 square feet. ThePoinsettia Private Studio Suite floor plan totals approximately 330 square feet with a combined bedroom/sitting area with closet and a private bath. The Fox Run & Carolina Private Studio floor plan includes approximately 290 square feet of living space with a private bath, private bedroom/living area, and private closet. ThePoinsettia Premier Suite floor plan totals approximately 330 square feet that includes a separate sitting area, private bedroom with a walk-in closet, and private bath. The Carolina Private Studio Deluxe floor plan offers a larger living space with approximately 335 square feet. The studio includes a large private bedroom/living area, private bath, and two private closets. Our Fox Run & Poinsettia 2 Room floor plan is the largest of the floor plans in our assisted living community with approximately 565 square feet of living space. Each apartment includes a separate bedroom, a separate living room (could be used as a second bedroom), a private bath, and a closet. Perfect for a couple or for a resident who wants a larger living space. The Springs at Simpsonville’s mission in caring for those with memory impairments is to keep them engaged and active and to provide the best quality of life possible. Toward that end, we believe in making the most of common areas and companionship. Our residents spend most of their waking time in our common areas rather than in their apartments. With that in mind, all apartments in our memory care neighborhood feature companion living with each apartment opening directly into the common area to support ease of navigation and staff oversight. 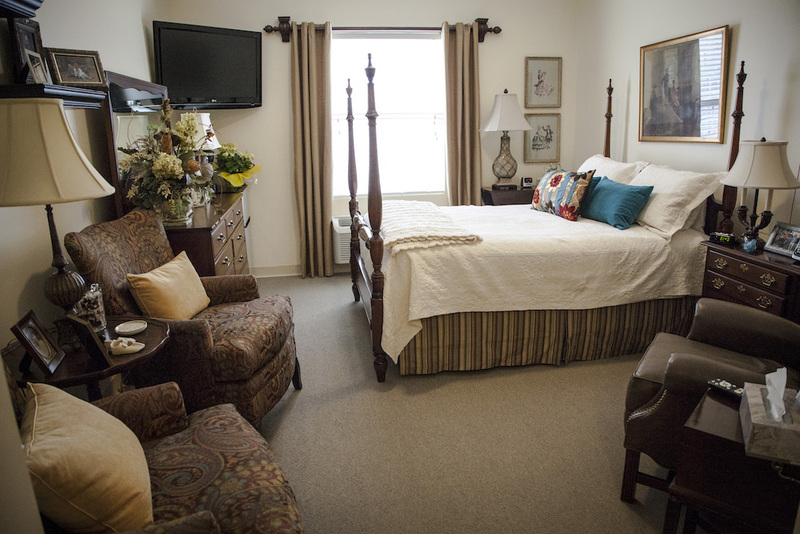 The Cove Memory Care Semi-Private Suite offers approximately 335 total square feet of living space. Two residents share a bedroom/living area and a bathroom. Each resident has a private closet to store personal belongings.